Sunday fun day was spent in Palm Springs with the family as we celebrated my birthday at one of our favorite hotels in the desert. The J.W. Marriott Resort Palm Desert has been our family's home away from home since I was a child. In fact, for the longest time the hotel WAS Palm Springs as we rarely left the compound on our visits. There was simply so much to do, so much to explore! My brother and I would harass the lobby parrots for hours on end desperately trying to train them to say dirty words. We'd take the boat ride around the man-made lake, hopping on and off to dip our feet in the various pools. We also harassed and chased the flamingos and ducks. A lot. Ahh, such simple stimulants yet fun was had. It has been years since we've been back so it felt especially memorable and nostalgic to be there on my birthday. On this day I can't help but reflect on my life and the past year. The past 365 days have been tumultuous, unexpected, difficult at times but momentous in every way and magnificently exciting. I've decided that no matter what happens in life, I will live and die by these words: "We all have just one life to live, but there are infinite ways to live it. So find your path, take control, blaze on, and never look back." The Sunday outing also marked the second edition of "3 Ways to Wear d.RA." This time, I chose a fabulously bright d.RA Collins flared mini skirt as my staple piece. I kept it simple and clean for my first look (brunch at the hotel), completing it with a black turtleneck, Isabel Marant-like booties from Just Fab and my Follis NY purse. The skirt is short and flirty so both the length and cover-up appeal of the turtleneck served as a fashion contrast. The laid-back chic booties kept the look casual and appropriate for a weekend brunch under the sun and my oversized Follis cameo purse subtly pushed the envelope. A rose gold Guess watch and a spiky bracelet from Shop Publik (my friend's fabulous shop!) accessorized the look. In the afternoon, we went to Cabazon to indulge in guilt-free outlet shopping. I layered a fitted GAP denim and channeled my inner Shania Twain. Surprisingly, I didn't end up buying anything at Cabazon although a tangerine red patent leather Bokier satchel got my heart palpitating for a few beats. I can still hear it calling my name. Faint, but audible. For the nighttime festivities, I didn't feel like wiggling into a dress so I made simple substitutions. I changed into a leather and tweed jacket from Kova & T, switched out the day purse for a Proenza Schouler x NM x Target iPad pouch/clutch, and black wedges from Cheap Monday. It's amazing how a few fashion tweaks can completely transform an outfit as I went from country to urban in just three style steps. I'm standing dangerously close to the flamingos. Old habits die hard! gorgeous photos! you look amazing. Love your trasition from day to night! That skirt is beautiful. Hope you had a great birthday! I love the light and airy floral with dark contrasts! You are toooo cute & fab for words....totally head to toe chic!! I'm also a huge fan of Palm Springs! How gorgeous are you! Loving all these outfits, turtlenecks are such a closet staple, they make everything look polished. love the location of these pics! Very pretty!! 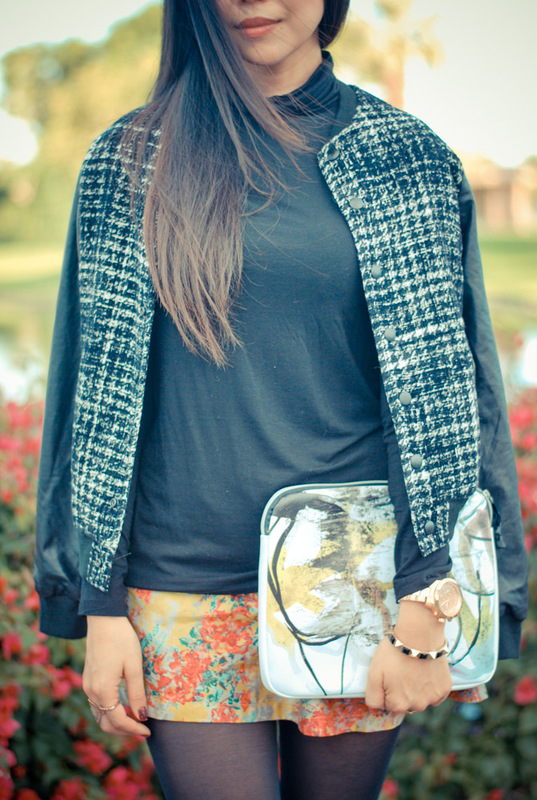 Love how you mixed the florals with the winter colours!! love this! shorts and tights are one of my fav fall staples! Happy Birthday darling =) I'm glad you had fun on your birthday. It's good that you reminisce and be thankful for what you have now. My favourite item on you is the jacket from Kova & T.
Very cute shorts/skirt and lovely blog. I love this skirt ..
thanks for visiting my blog would you like to follow eachother via gfc? I just spotted your blog and cannot believe that it took me so long. I must say that I really enjoy the way you write and mix the different fashionable ingredients. I will definitely stay tuned. You look so beautiful.Love your style.